• Sensitive and accurate. Uses 50 μL samples. 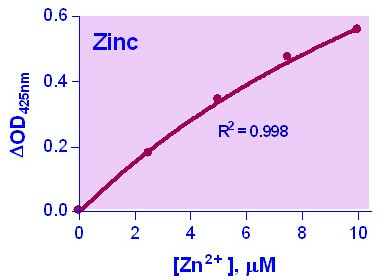 Linear detection range 0.12 μM (0.78 μg/dL) to 10 μM (65 μg/dL) zinc in 96-well assay format. • Improved reagent stability and versatility. The optimized formulation has greatly enhanced reagent and signal stability. Cuvette or 96-well plate assay formats possible. • Low interference in biological samples. No pretreatments are needed. Zinc is an essential trace element and plays many key roles in metabolism. It is required for the activity of more than 300 enzymes, the structure of many proteins, and control of genetic expression. Zinc status affects basic processes of cell division, growth, differentiation, development, performance and aging through its requirement for synthesis and repair of DNA, RNA and protein. The common causes of zinc deficiency are low dietary intakes and low bioavailability. Clinical signs of zinc deficiency include acrodermatitis, low immunity, diarrhea, poor healing, stunting, hypogonadism, fetal growth failure, teratology and abortion. Zinc deficiency has now been recognized to be associated with many diseases such as malabsorption syndrome, chronic liver disease, chronic renal disease, sickle cell disease, diabetes, malignancy, and other chronic illnesses. Simple, direct and automation-ready procedures for measuring zinc concentration in biological samples are highly desirable in Research and Drug Discovery. BioAssay Systems’ zinc assay kit is designed to measure zinc directly in biological samples without any pretreatment. The present method utilizes a chromogen that forms a colored complex specifically with zinc. The intensity of the color, measured at 425 nm, is directly proportional to the zinc concentration in the sample. 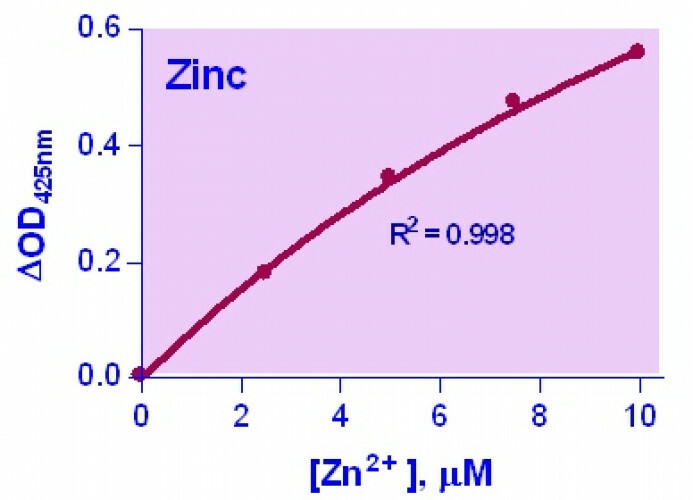 Applications For quantitative determination of zinc ion Zn2+ and evaluation of drug effects on zinc metabolism. References Assay: Zinc in Mouse Serum (Pubmed). 2. Padiglia, A et al (2010). Sensitivity to 6-n-propylthiouracil is associated with gustin (carbonic anhydrase VI) gene polymorphism, salivary zinc, and body mass index in humans. Am J Clin Nutr 92(3):539-45. Assay: Zinc in Human Saliva (Pubmed). 3. Gunasekara, P et al (2011). Effects of zinc and multimineral vitamin supplementation on glycemic and lipid control in adult diabetes. Diabetes Metab Syndr Obes 4:53-60. Assay: Zinc in Human Serum, urine (Pubmed). 4. Leung, KW et al (2011). ZIP2 and ZIP4 Mediate Age-Related Zinc Fluxes Across the Retinal Pigment Epithelium. J Mol Neurosci . Assay: Zinc in Human Retinal pigment epithelial cells (Pubmed). 5. Kelly, E et al (2011). Redistribution of labile plasma zinc during mild surgical stress in the rat. Transl Res 157(3):139-49. Assay: Zinc in Rat Plasma (Pubmed). 1. Knoell, DL et al (2009). Zinc deficiency increases organ damage and mortality in a murine model of polymicrobial sepsis. Crit Care Med 37(4):1380-8. Assay: Zinc in Mouse Serum (Pubmed).